(2016-04-24, 03:26)Daydream Wrote: EMM does not store the resolution of art files (poster, thumbs, fanart, etc), correct? *EDIT* - Just got home and tried this out, no go. I replaced tvshow with episode for everything except first 2 tvshowlists, still nadda. What am I missing?? 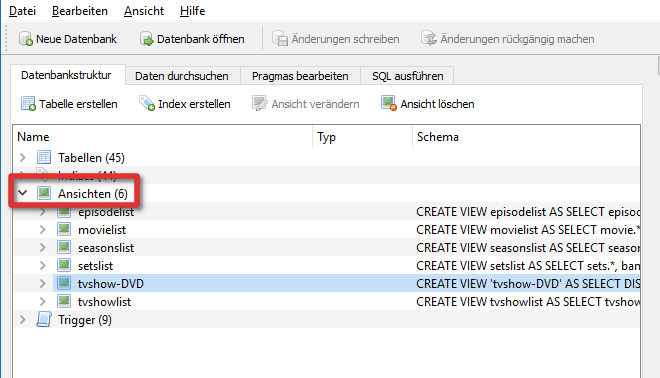 Well, I'm not an expert but for starters there is no TVShowVStreams table in the database (if you just replaced words in the syntax of a previous query, it doesn't work like that; get SQLiteSpy and look at the database, the MyVideos37.emm file or whatever it is). 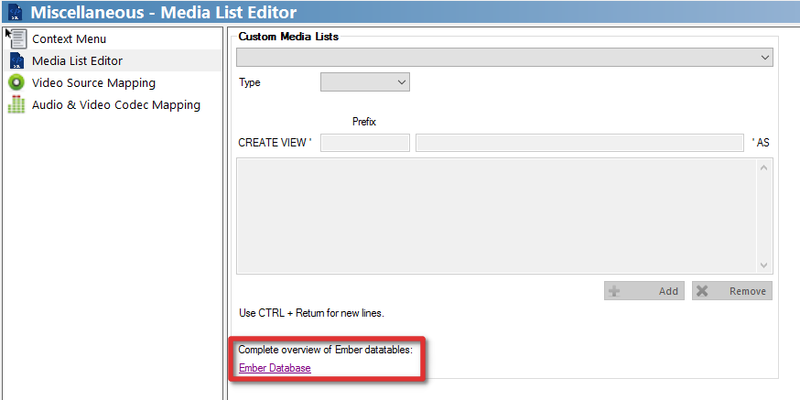 Further there's some description here http://embermediamanager.org/databasemodel/index.html for what's what. I'd like to understand better too what can we do with episodes. If a movie is a standalone element and everything can be referred to it, an episode is part of a season, part of a series, and displaying a selection works in a more complex way. A proper query should show only the series, with only the seasons, with only the episodes that respect a certain condition. I can't get it to work like that right now. As it stands there is no direct connection (that I can see) between TVVStream (the table I believe you were actually going for), and the tvshowlist view. We could double join with the episode table but I get weird results. Somebody that is stronger with the Force (*cough SQL*) should show us . That's not possible with episodes. There is no "episodes only" list that we can display to list all episodes by a query. I think we have to change the tv show view/list to make it possible to use custom season/episode filters. (2016-04-28, 03:50)Daydream Wrote: Well, I'm not an expert but for starters there is no TVShowVStreams table in the database (if you just replaced words in the syntax of a previous query, it doesn't work like that; get SQLiteSpy and look at the database, the MyVideos37.emm file or whatever it is). Further there's some description here http://embermediamanager.org/databasemodel/index.html for what's what. Yeah, I have no idea what I'm doing (if it wasn't obvious already). Thank you for the link, now I actually have something to work with lol! Thank you for trying! (2016-04-28, 09:42)DanCooper Wrote: That's not possible with episodes. There is no "episodes only" list that we can display to list all episodes by a query. Ok, so I didn't know what the hell I was doing AND it's not possible Thank you for the info! (2016-04-28, 19:42)Fail$tyle420 Wrote: Ok, so I didn't know what the hell I was doing AND it's not possible Thank you for the info! Dan is possible to create a list of all tvshows is not "Locked" or with the status "Continuing" and not "Ended"
(2016-05-10, 13:08)brunosso Wrote: Dan is possible to create a list of all tvshows is not "Locked" or with the status "Continuing" and not "Ended"
Is there any way I can undo my error or do I have to delete the entire database and start from scratch? In this build you can start Ember and go to the settings without a crash. The catching of wrong SQL queries is not fully done atm. The "views" are saved in the database. You can open the MyVideosXY.emm with an editor like SQLite Browser. Go to "Views", search your custom entry and delete ONLY THIS ONE. BTW: main.Sources is wrong. How do you create your query? I have a single source with subfolders HD and SD and wanted to view only those movies in the SD subfolder. After the required reboot nothing had changed and the query was gone so I thought perhaps I needed to add a table with that query. That's when I triggered the database error. While writing this down I noticed at least one mistake I made, "Soures.Name" is never going to give me te result I want since "\SD" isn't part of the source name but of the path instead. For the record, I was using the BETA 1.4.90-alpha.Git.9457867 version and can confirm that with the latest (1.4.90-alpha.Git.b29978b) it is not crashing. Lots of thanks for the rescue and the clear instructions to solve the mess I made. The database is OK again. Super! I should've made a backup first off course when I go messing with things I am still learning about. Can you give me a hint how I should have made that query to show only movies where the path contains a specific string? Should I have used Sources.Path instead? I must have made another critical error because if it was only the wrong object (.Name instead of .Path) I just would've gotten an empty. Again thanks for saving me some hours rebuilding the database. (2017-08-29, 23:14)PH-SYM Wrote: Can you give me a hint how I should have made that query to show only movies where the path contains a specific string? The point is that the table for movie sources is no longer named "Sources", it's now "moviesource". Actually, there is an overview of the current database. Actually means "in theory"... Just checked and seen that I had not updated the overview for months. \SD if your movies are saved in "D:\Movies\SD"
% Wildcard, is the same like * if you search in Explorer, e.g. "D:\Movies\SD*"
Just wondering if someone can help. It's beyond my knowledge to create a custom list. I would like to have a list of TV Shows when it was premiered and a separate one when was it added to database? Is that complicated to make?